Ras Al Khaimah has been making strong headway positioning itself as a major real estate destination in the UAE. With high-profile developments such as Al Hamra Village, the emirate is gaining favourable feedback from tenants looking to transition into home ownership, as well as investors on the lookout for opportunities. Barry Ebrahimy, head of Commercial at Al Hamra Real Estate Development, shares why it makes sense to invest in Ras Al Khaimah by comparing the emirate with the Dubai property market. 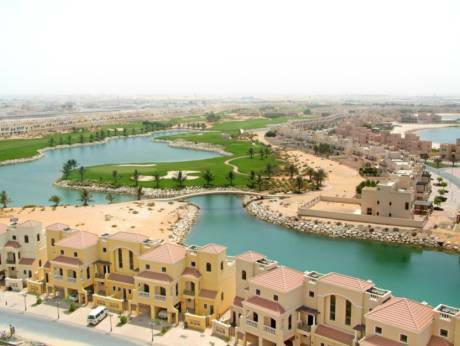 Being one of the major players in Ras Al Khaimah, how would you assess the performance of the property market there? Average rental rates at Al Hamra are definitely bucking the overall UAE trend with a studio available for Dh32,000, one-bedders for a very acceptable Dh48,000, a two-bedroom unit for Dh67,500 and our top-end five-bedroom villas at around Dh325,000, all of which represent a compelling value option for tenants. According to Asteco, apartments in popular Dubai areas, including Jumeirah Lakes Towers and Dubai Marina range from Dh1,180-Dh1,420 per square foot. In Business Bay, Dubai International Financial Centre and Downtown Dubai prices are Dh1,345, Dh1,650 and Dh2,000 per square foot respectively. Villas in Dubai’s established communities are selling from anywhere between Dh1,125 per square foot in Arabian Ranches to Dh2,245 per square foot for top-end villas on the Palm Jumeirah. Comparable units in Al Hamra Village, including the latest addition to our portfolio, the three-, four- and six-bedroom Bayti homes, are selling for between Dh536 and Dh714 per square foot, representing outstanding investment opportunities, particularly with the array of villa sizes and configurations that are available. Considering the current trend, what type of properties are in demand in the northern emirate? From an Al Hamra Village perspective, we are an attractive proposition for investors, end users and tenants. For end users, not only do we offer an inclusive, friendly, convenient and secure lifestyle, quality product and the appeal of a mixed-use community, there are also clear benefits when it comes to value, cost and appreciation if you compare property prices in Ras Al Khaimah against those in Dubai. Our newest development, Bayti, a community of 118 upmarket town houses, offers a great quality of life with three sports and leisure parks, outstanding build quality, spacious floor plans, appealing cost of ownership and impressive yields. This is the kind offering attracting investors who have traditionally focused on Dubai or Abu Dhabi. There were project launches during Cityscape Global. Do you think there is enough appetite from investors and buyers to absorb the new supply? I am very happy to say that we are very close to 100 per cent occupancy in our more than 1,100 villas and upwards of 2,500 apartments. We have just 9 per cent of the total land area of Al Hamra Village available to develop, so we are currently looking at the opportunities elsewhere within the emirate and the wider UAE. How does the average yield compare with yields in Dubai? Investment and rental yields are very attractive. Investors are seeing 9 per cent net return on smaller apartments and nearly 8 per cent per year net returns on town houses and villas. What is important is that the community is almost full and properties don’t sit vacant as demand is very strong. It is also important to note that unlike other emirates, rental rates have increased year-on-year, while vacancy rates have continued to drop. Rental rates have witnessed positive increases of 15 per cent for villas, while apartments saw an 8 per cent hike in leasing rates, further underscoring the positive return on investment. The latest addition to our portfolio is Bayti. A typical three-bedroom town home at the Bayti community is almost 2,900 sq ft and priced at approximately Dh556 per square foot. These homes see a 7 per cent rental yield after all expenses. That is a very attractive return on a large home. In addition, the capital appreciation demonstrated year-on-year is considerable. These represent outstanding investment opportunities, particularly with the array of villa sizes and configurations we have available. How much has RAK’s property market been impacted by the current economic scenario and the general slowdown in property markets? The impact of low oil prices has undoubtedly had a bearing, however, we are confident there will be an improvement this year. We have created a model that works very well for us in that we only build properties when we know there is demand and we are able to build and complete on time and on schedule. This resulted in a strong financial performance last year with all Al Hamra business entities (real estate, hotels and shopping centres) performing well. We are confident of further growth thanks to a burgeoning tourism industry in Ras Al Khaimah, which will undoubtedly have a positive knock-on effect to our hotels and demand for our residential offering. What are the pros and cons of investing in RAK? How is the regulatory environment there? First and foremost, it is the quality of life. [It offers] a peaceful, stress-free environment ideal for families and those seeking a slightly slower pace, without downgrading on entertainment, dining, retail and education options. The cost of ownership is also very attractive, and the quality of the build is as good as, if not better than, anything in the UAE. The location is also a major factor: Al Hamra Village is just a 45-minute drive from Dubai Airport. Rather than cons, I would suggest certain misconceptions. There is the perception that Ras Al Khaimah is further away than it actually is. This is something we are keen to highlight to the market, to give an idea of just how close we are to Dubai.